High-quality razors and natural care products without alcohol, parabens and animal testing. Our passion: the best shave. Our mission: the perfect morning. Our magazine, which provides everything you need for your day. All about our team, vision and how we aim to get to the sharp side of the force. It is important to us producing products, that are good for you and our environment. Our first pop-up barber shop. Go check it out! 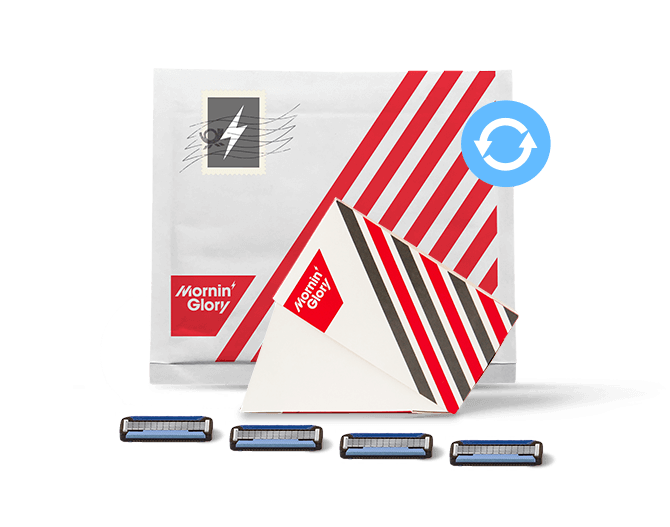 Welcome to Mornin’ Glory – your online shop with well-priced razor blades. Since 2012 we are the smart alternative to razor brands you can find in the supermarket aisle. Our mission is quite simple: We give you good razor blades at a reasonable price. And you can choose freely if you want to buy razor blades separately or if you want to receive your razor blades in an easy-peasy blade subscription. We will send your blades definitely free of shipping costs, right on time and directly into your letter box. Well-priced doesn’t mean lack of quality though. 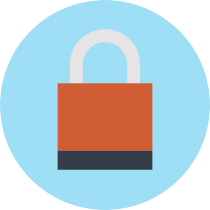 Quite the opposite – because of our clever brand strategy we are able to offer you fair prices despite the fact that they’re also high quality products. Next to our 3-blade-razor Freshman and the razor Alpha with five blades you can purchase natural grooming products at Mornin’ Glory since 2014. 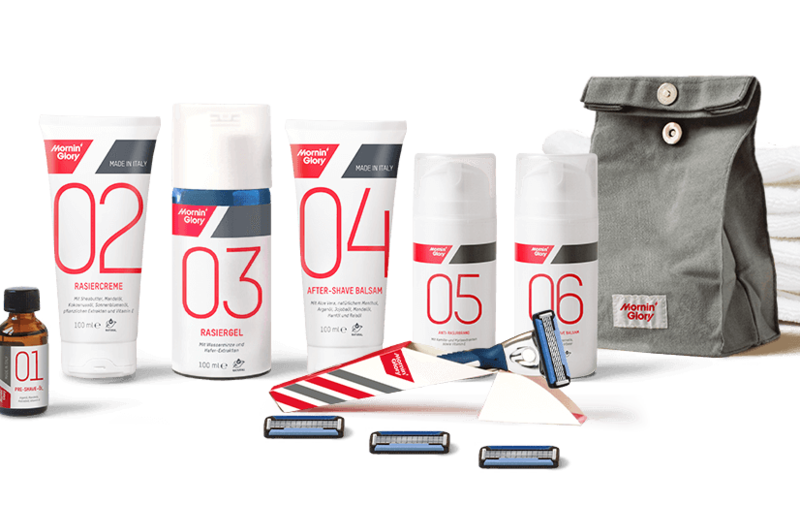 Because in our opinion razor blades and grooming belong together. Always. Hand in hand. Hence you can get everything from one source and you will have the certainty, you will be well groomed at any time and anywhere. Before you wet shave we recommend our high quality Pre-Shave Oil. Argan oil and avocado oil prepare your skin perfectly for the shave. The Pre-Shave Oil helps avoiding micro cuts and eases the cutting of beard hairs sustainably. For shaving you can purchase our Shaving Gel and our Shaving Cream. With natural ingredients both care for your skin, have a great fragrance, and help you to removing your facial hair easily. This way the Shaving Cream glide gently over your face and leave nothing behind but smooth skin – you will feel the grooming effect already while shaving. After your shave pamper yourself with our after shave balm! The After-Shave Balm moisturises your skin without any burning. The After-Shave Balm of Mornin’ Glory doesn’t contain any alcohol but contains high quality ingredients like almond oil, menthol and argan oil. Itching and dry skin will be avoided right from the start – there is a reason the after shave balm is our top seller. When push comes to shove, you will have a reliable partner on your side: the Razorburn Relief. The cooling gel is an effective method to alleviate razor burn and shaving pimples as well as itchy skin and redness after wet shaving. The firefighter of all grooming products will always go into action when your skin needs rapid help. If you’re also convinced now, just try one of our novice packages like the Starter Kit One or the handy Travel Kit with small grooming tubes when you’re out and about. One more issue: All of our grooming products comply with our own quality promise. That means we don’t use parabens or alcohol (in our products) and there is no animal testing. Our products are locally produced, that means in Italy and Germany. Thus we have total control when it comes to the quality of our grooming products in order to offer you the best products possible. As you can see our mission is nothing less than improving the wet shave. Behind the name Mornin’ Glory stands a competent team which wonders day-to-day how we can improve our services and provide more and more men with well-priced razor blades. By the way: If you see the passion in shaving and not the usual obligation and if you want to be part of an innovative team please write us an email to job@morninglory.com with your skills. We are looking forward to every companion in the everlasting fight against beards. Mornin’ Glory – smartly different.